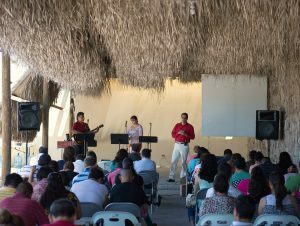 Relationship-based evangelism, discipleship and the forming of networks of home-based churches in Guadalajara, the 2nd largest city in Mexico. We have a great challenge here as we minister in what is known as the “Circle of Silence”, an area in southwest Mexico with many large and important cities, but steeped in religious traditions and largely unresponsive to the Gospel, as only 1-2% are evangelical Christians. Our vision is to develop various home church networks through which many disciples and disciple-makers will be made so as to see Christ change the spiritual face and climate of this vital area of Mexico. You will be primarily working with middle-class people, many of whom wish to expand their ability to speak English. You will also have the opportunity to develop your ability to communicate in Spanish as you are involved in a variety of relationally-based connections and ministries, getting to know people on a more personal level, and developing confianza, a vital concept in Mexico which means “trust”, and implies a more personal openness. TEAM missionaries Ralph and Ellen Shepard and Paul and Jann VanderMey, head up this initiative, but also enjoy mentoring and coaching others in whom they see a God-given desire for spiritually investing in others. They will help you learn to connect with people, bring them to Christ, and disciple them. They will also guide you in learning more about the gifts and personal resources God has built into you, and expand your toolset for interpersonal evangelism and discipleship. Social communities for building friendships with the unsaved (sports in the park, barbecues, ESL, etc). Home-based communities – believers coming together, with non-believers also present, to experience Christian community. Discipleship communities – groups of 2-4 coming together for studying the word, for more intimate sharing, for praying for one another and for stimulating one another to spiritual growth. Network communities of 25-75 who come together every month or two from the various home-group networks for sharing testimonies, praising God, interacting with the Word, and focusing on the vision God has given us. Our ministry team is made up of Americans and Mexicans who meet together to share stories, talk about vision and strategy and seek the Lord together. Continually seeking to develop creative methods of evangelism which will allow us to intersect and connect with their lives and their reality. In church planting ministry any and every interest one has is a potential connection point for those who have a genuine interest in others and a willingness to step out and be poured out for Christ. People skills are vital, but we also need a broad range of skills and abilities to help us develop relationships and ministries in our diverse context. 1) A person with training, experience and education in Bible/theology, evangelism, discipleship and leadership training. 3) A person who has a strong heart for ministry and a desire to plant churches in a home-based network in an urban setting. 4) Good communication skills in English and Spanish. 5) Looking for a married couple, but are certainly open to discussing the opportunity with any single who feels led to apply as well.